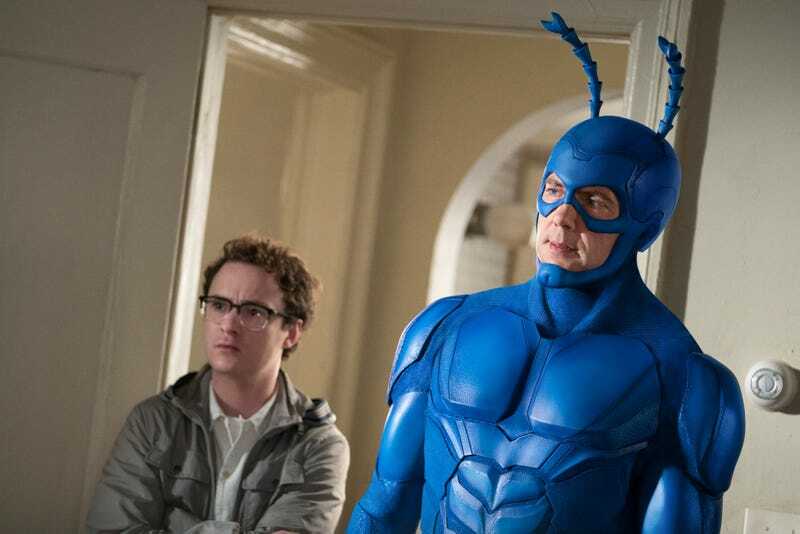 With three episodes remaining, details are rapidly coming together on The Tick’s first season. After we see Superian faint after showing up at Tinfoil Kevin’s door, the show doesn’t waste time telling he’s suffering from Big Bismuth Poisoning, with the episode’s primary mystery coming from where he’s getting it from. Superian is often played for laughs in this show; he’s supposedly the mightiest superhero of them all, but he often appears aloof and oblivious. Seeing him in intense pain as his body grows and hotter and hotter adds essential humanity to his character, and reminds us that despite his silliness, he means a lot to the people who in habit The Tick’s world. As this is happening, Karamazov is stored inside a machine that momentarily hides his tiny body, and he’s a little too excited about it, considering the circumstances. This would ultimately prove to be Karamazov’s finest hour, however, as we learn more about how he came in contact with The Terror, and how his career was ruined. He had attempted to invent a growth ray to solve Urmania’s hunger crisis, but when the unveiling of his invention ended in disaster, it ended his career. Then, he discovered that Big Bismuth is Superian’s lone weakness, and when The Terror caught wind of this, he kidnapped him, and forced him to work for him. We also learn that the lab blown up by The Tick earlier in the season had contained everything he had developed, though he was happy to see it gone. After wondering what Karamazov has been up for the past few episodes, he appears to be quite sympathetic character, although a twist revealing his ulterior motives wouldn’t be entirely shocking. As this is going on, we find out that The Terror is working with ad agency to come up with the best way to announce to the world that he is, in fact, alive and well. This gave us an amusing sequence where he is given ideas that he rejects as being “too cliche” (he’s got a point about the “stroking a cat” angle), and is not uninspired to laugh maniacally at their slapstick comedy (though he does chuckle maniacally). This was a brief scene, and the only appearance of The Terror in the episode, but it does an effective job of driving home the point that Terror is an atypical villain, and can’t be treated like any other old bad guy. Overkill and Dot are still working to take down The Terror together, but their budding romance runs into a wall, albeit briefly. Overkill dismisses Dot as being in over her head, and the confrontation becomes rather intense. At this point, it’s not entirely out of the realm of possibility that he could have a heel turn in him, and when it briefly looked like he might harm Dot physically, it was definitely a catch-your-breath type of moment. The show continues to thrive when it forces us to guess what its characters intentions may be. In this case Overkill apologizes, and admits that Dot is playing an essential role. Perhaps more importantly, when Lint refers to her as his girlfriend, he neither confirms nor denies it. As for Lint, in one of the most well-done scenes the show has had so far, we learn that her ability to conjure electricity is essentially running The Terror’s entire plan. WitShe lights up the entire sky, and at this point, we find out that Terror and Lint are using the Very Large Man against Superian. He was enlarged by Big Bismuth, and when he gets stronger, Superian gets weaker. 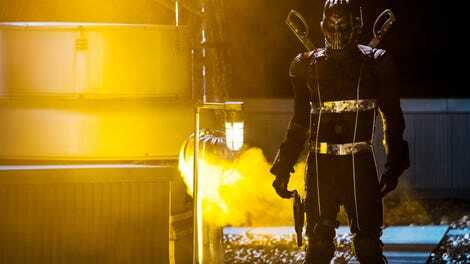 Scariest of all, he’s headed for New York, setting us up for a chaotic final two episodes. Equally interesting, though is how much Terror’s plan depends on Lint’s power. Ultimately, she holds the upper hand, and doesn’t appear to be afraid to use it. This episode wasn’t quite as funny as earlier ones, because with so many questions to answer, it seems harder for the writers to fit in as many jokes (though there are a few good ones). That being said, the intrigue is more than enough to keep things going, and the show does an adroit job of revealing a little more with each passing episode, while still making us wonder how they could possibly wrap everything up neatly in just two more episodes.